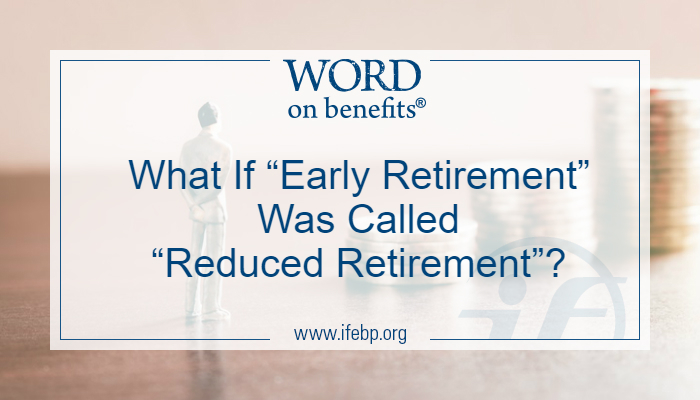 What If “Early Retirement” Was Called “Reduced Retirement”? What If “Early Retirement” Was Called “Reduced Retirement”? I hope everyone had a great National Employee Benefits Day! 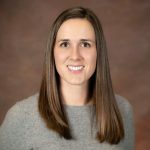 On Benefits Day, the International Foundation hosted a free webcast, Small Tweaks, Big Impact: The Power of Behavioral Decision Making for the Plan Sponsor, presented by Steve Vernon, a research scholar with the Stanford Center on Longevity. 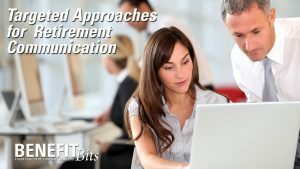 The webcast provided advice to help plan sponsors look at their benefits and communication initiatives with fresh eyes. Our standard benefits lingo includes terms like normal retirement age, early retirement and late retirement. These words mean something very different to those outside of the benefits office. Early has very positive connotations, normal equates to what you should do and late has negative implications. But what if we reframed these. Instead of using early retirement, which implies a win (who doesn’t want to retire early? ), what if we used reduced retirement which implies a loss? And instead of late retirement which implies a penalty or a failure, we used increased retirement which implies a gain? People tend to think of their future self as essentially someone they don’t know. How many times have you put off exercising or starting that diet until tomorrow? We value our “present selves” much more than that stranger “future self.” Help your participants realize their future self is not a stranger by using apps such as AgingBooth that show what they’ll look like when they are older. Techniques like this can remind employees that the future is coming, and they need to make decisions now that will help them tomorrow. Learn more about varying messages in your retirement communication in this Benefit Bits video. If you’re hosting a retirement workshop, have previous retirees come in to share their successes and regrets. Stories from real people can be more powerful than even the most eye-popping statistics. When employees hear directly from their colleagues, it has much more impact than any declaration from the HR office. If you’ve taken any psychology classes, you’re probably familiar with the marshmallow test—a study where young children were left alone with a marshmallow and told they could eat one marshmallow now OR wait 15 minutes and have two marshmallows. Most of the children had good intentions . . . but about half couldn’t wait and chose the yummy marshmallow right away. As adults we might think this is a symptom of childhood that we outgrow—but the facts say otherwise. We tend to take immediate gratification over delayed gratification, even if the delayed gratification would be in our best interest. Know that this bias to live for the present exists, and try to design and communicate your benefit programs for the irrational people that we all are. Want to learn more? View the on-demand webcast: Small Tweaks, Big Impact: The Power of Behavioral Decision Making for the Plan Sponsor.